Pictured with the original Bionic Gear Bag, both of these are made from the fabric line “Draw Near” (at the time of this post) is currently available in the store on this site. This one is sized to hold 3×5 cards (or a small notebook), a 24 pack of crayons, and pens & pencils. 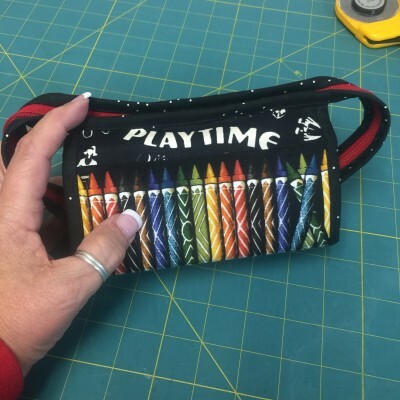 There is only one zippered pocket. This one sews up *fast*! As pictured, it is 6″ wide. 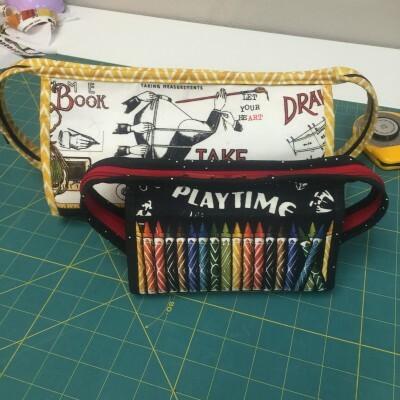 Just cut all of your pattern pieces wider to make a wider bag, if you desire. The pattern (complete with tutorials and pictures) will be on Craftsy soon. BUT… in the meantime, if you already have the Bionic Gear Bag pattern, you have enough instructions to know how to make this one. 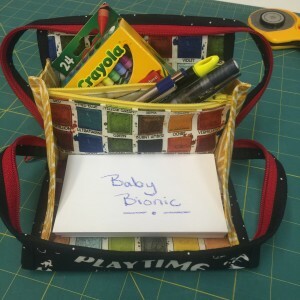 The original pattern draft of the Baby Bionic Gear Bag is a downloadable PDF which is available in our store. Draft pattern for those that have the BGB pattern instructions is HERE. ← Zippers are headed outta here!